BY MARCY SHORTUSE – How strange will it be to start the 2019 tarpon season out without Capt. Cappy Joiner’s voice on the radio. His presence was huge in Boca Grande Pass, as well as in the village. 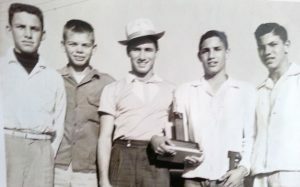 While the feelings people had for him were wide ranging no one would contest that he was a local authority on fishing, on island history and on life lessons in general. It will seem awful quiet around here for many, many years to come. On Wednesday, March 13 Cappy passed away surrounded by his family in the home he loved so much. It is a home he shared with his lovely bride Sally, and it is filled with photographs of his family, his beloved dogs, and his hunting and fishing trophies collected over many, many years. Cappy was born in the fishing village of Gasparilla, on the north end of the island, to parents James ”Gilbert” and “Billie” Elvera (Rodriguez) Joiner. Billie’s family came to Cayo Costa from the Canary Islands in the late 1800s and she was born on the tiny island in 1916. She married Cappy’s dad in 1936 and he was born a year later. Cappy always said the first Joiner from his family that came to America was in 1768, from the island of Minorca in the Mediterranean. Cappy explained the family last name wasn’t “Joiner” until that first ancestor set foot in St. Augustine. The name came from the boat-building trade. Cappy’s grandfather Samuel James was born in Bradenton in 1892 and moved to Gasparilla Island in 1916. Cappy’s father (known then as “Gilbert”) was born here in 1918. Growing up in Gasparilla Village, there was little to do except fish. There were about 20 homes in two rows there, where Marina Village stands now. Cappy’s family didn’t have electricity until he was about 14, and no running water. He rode an old wooden school bus down the dirt road that led to Boca Grande. In those days a captain charged $65 for a full day of fishing. Times have changed. In 1966 he bought a second boat, this one named “Searene.” While his home base was still Fort Myers, he continued on with his charter fishing around Gasparilla Island. From November through March you could find him mackerel fishing from here to the Keys, tarpon fishing here April through July, then mullet fishing Fort Myers Beach from July through November. In 1967 Cappy’s profession took a jag to the left, as he met with a Chevy/Cadillac business owner in Fort Myers and decided he wanted to try his hand at selling cars. He did that for quite awhile, but it took him down to Naples and he bought a home there. That lasted until the sea called him back in 1975. He couldn’t resist, and bought a 40-foot Sportfisher he called “Sea Jay.” By 1979 he also had a 51-foot trap boat built by Billy Tyner, and had two boats working full-time with crews of four to five men on each boat. By 1985 he had almost 7,600 lobster and stone crab traps in Florida Bay as well. In 1981 Cappy bought the “Sally J,” the boat most people now know him by. Why did he name her that? Because of his new bride, Sally Sheets, whom he had met in 1970 and married in 1980. She was his fishing mate and best friend for many, many years … all the way up to his passing. After moving around a bit more up and down the Florida coast, Cappy settled into a permanent home in Rotonda in the mid 1980s, when he was 49 years old. Cappy then finally had a chance to take some time and do some serious hunting as well. Deer and elk in Colorado, antelope in Wyoming, turkey in Florida and Alabama … if it moved and was tasty, Cappy would hunt it. Cappy’s love of a good dog was always true as well. It was rare to see him around without one of his Labrador retrievers, and they stuck by his side like glue. Cappy played a vital role in the slow but steadily-changing fishing politics that took place in recent years in Boca Grande Pass. While he admitted he played a part in the “hellbent-for-leather” fishing tournaments of decades past where the lives of the fish weren’t as important as a good wall mount or winning a tournament, he was one of the Boca Grande fishermen who took a stand to make things right. He wasn’t against keeping a huge tarpon for a mount, but he didn’t want to see the fishery die away at the hand of those who continued to fish with blatant disregard for conservation. 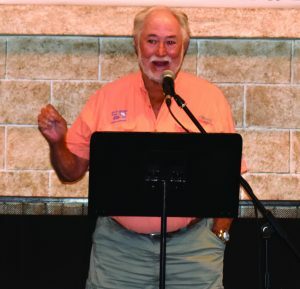 More than once Cappy represented the Boca Grande Fishing Guides Association as the organization’s president in front of state governmental officials and Florida Fish and Wildlife chairmen to make it clear that the Boca Grande jig needed to be banned. They eventually won that battle, but the war still continues. When it was time to determine tides for a tournament, Cappy was called. Whether you wanted to hear a lecture or not, if you had a serious question about fishing you called him first. His memories of the Pass and his fish stories were golden; you can’t find people to tell a tale like him anymore. “There will never be another Cappy!” said islander and relative Betsy Fugate Joiner. “His legacy will live on through his children and grandchildren forever. He loved sharing his memories of growing up in Boca Grande and continued to be a teacher and supporter of our fishing heritage. He was passionate about fishing, about hunting, about life, and most of all about his family. He was a really great dancer, and he claimed to make the best chowder ever (actually he had great chowder preppers that made him look really good when he served it up). See Cappy’s obituary on page 3. Newer PostLetters from the overwhelmed side: Can’t we talk about leafblowers?